Mos Le'Harmless island has been attacked by an unknown evil, and your help is requested by Sir Tiffy Cashien. 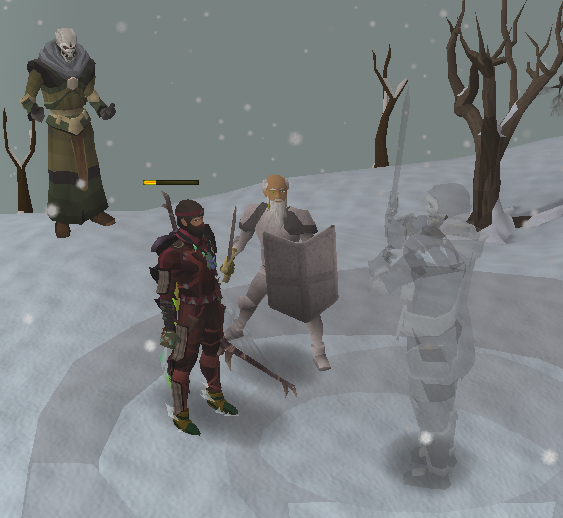 Can you stop the threat and save Gielinor in this quest? They signal their arrival with a devastating shriek, and leave nothing but ash, flame and destruction in their wake. All tremble in fear as they approach, and the ground rumbles in sympathy. Word of an attack on the isle of Mos Le'Harmless has reached the ears of Sir Tiffy Cashien. Should you choose to accept his request, you will be sent to aid Sir Tendeth who has come across a great threat to the world; one far greater than the pirates he was originally sent to investigate. Do you have the stomach to investigate this new threat, and see it through to the end? Or will you leave the world to its doom while you cower in fear? 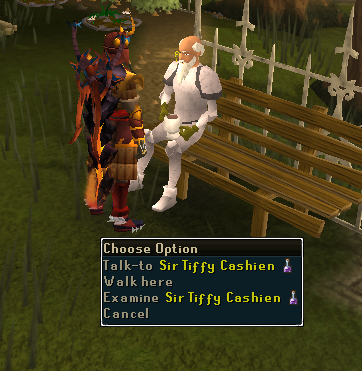 Speak to Sir Tiffy Cashien in Falador park. 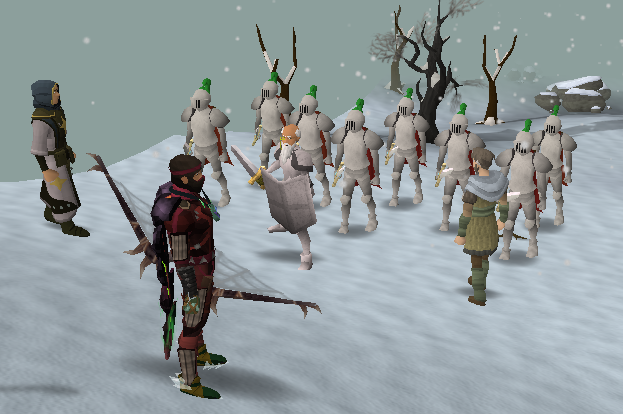 To begin the quest, speak to Sir Tiffy Cashien in Falador Park, selecting the "Ritual of the Mahjarrat" option, which will then lead into a conversation about a White Knight operative on Mos Le'Harmless. Sir Tiffy will then direct you to The Other Inn on Le'Harmless to speak to Sir Tendeth. Then, select the "Yes" option on the pop-up screen and the quest shall begin. 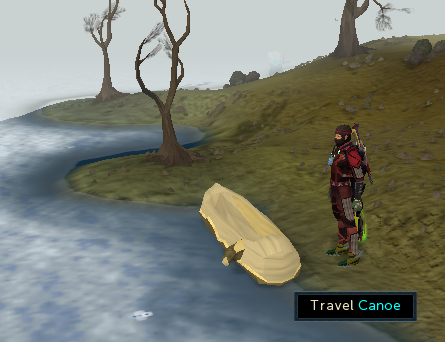 Before leaving the conversation, select the "Alright, I'll get right on it" option, this will then give you the option to be teleported directly to Mos Le'Harmless from Falador Park, select Yes. After arriving on the docks at Mos Le'Harmless, make your way to The Other Inn, (the one directly west of the Bank) and begin conversation with Sir Tendeth. 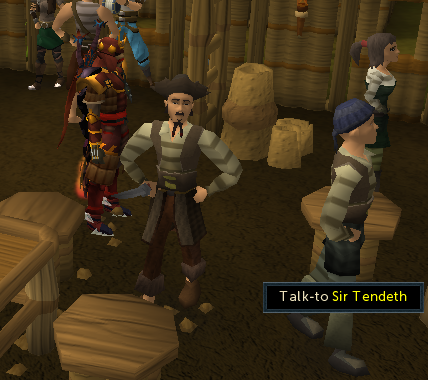 Sir Tendeth will inform you that the invasion he fears is not by Pirates, but something much bigger. You will then be warned that the Mos Le'Harmless Jungle is about to become significantly harder to move around in, and will remain so throughout the quest until completion. Agree to continue by selecting "Yes", and continue the conversation with Tendeth. You will then hear a loud screech, and a cutscene will ensue, where the ground and the pub itself begin to quake, and large eruptions of fire can be seen from the windows. When the cutscene ends, step outside and you will now see a number of pirates writhing on the ground in pain. Begin speaking to NPC's around the pub and you will be informed that the attack of the town was done by skinny dragons, who said something unintelligible and then flew off towards the jungle. Make your way out of the town and into the Mos Le'Harmless jungle; another cutscene will begin. Sir Tendeth will offer to come with you into the jungle, before being blasted by a fireball and killed instantly. You will then offer yourself some advice, warning yourself to make your way to the east of the Island to see who was behind the attack, seeking cover as you make your way there. For this part, it is recommended you bring a few high tier food items in your inventory, as you must make your way east, seeking cover behind trees. Failure to do so will result in getting yourself roasted by a fireball and sent to the entrance of the jungle, taking significant damage in the process. It is also recommended to wear some armour, in order to protect yourself from the aggressive Jungle Horrors which are always waiting to attack. The path you need to follow is marked by giant footprints and scorched earth. If you can't see this path, you may have strayed too far North. After making the journey just past Trouble Brewing to the clearing at the end of the jungle, another cutscene will begin, this time featuring the Dragonkin! They are discussing "The Rage", saying that the destruction they have just wreaked made the Rage subside, but continues to grow, concluding that someone is "using it". The Dragonkin then reveal they are on a quest to find "The False User" and will attack a larger settlement in the meantime, before flapping their wings and flying off. 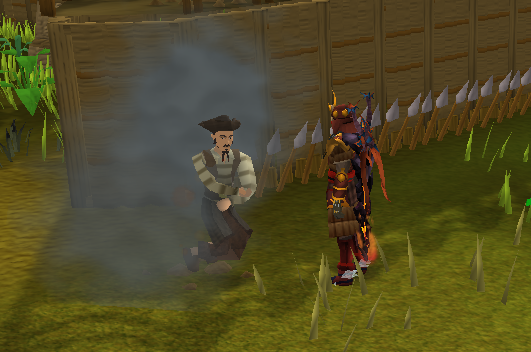 Naturally, worried about what you have just overheard, you conclude you should report back to Sir Tiffy in Falador Park. After informing Sir Tiffy of the demise of Sir Tendeth he asks who attacked the island, select "I think they were Dragonkin". After listening to your description, Tiffy says that what you saw would indeed seem to be Dragonkin, and leads you to the Archive Room for some background digging. 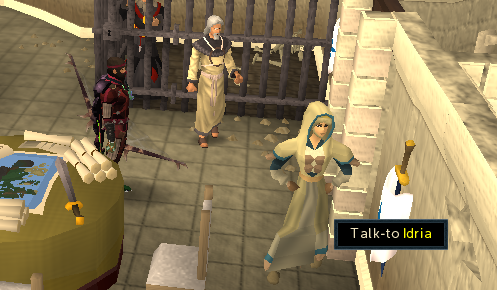 Once you're here, talk to Lady Table and inform her you think Dragonkin attacked Mos Le'Harmless. She will eventually read a note to you, written seemingly by Robert the Strong telling you how to unlock the secrets of the Dragonkin. You can then tell Lady Table that you think you understand the message. Tell her that you are the Stonetoucher, and that Robert the Strong has been reincarnated as Bob the Cat. Lady Table will then tell you to go and find Bob the Cat to investigate his collar, this is where your Catspeak Amulet comes into play. You can then press the arrow, labelled "Flip", which will turn over Bob's collar and display the letters " D I R A K S ", these are the Fairy Ring codes DIR, AKS, which lead to the barren plain of Kethsi. 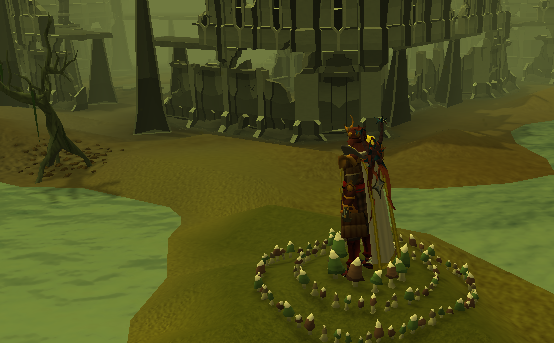 Make your way to the fairy rings and input the codes "DIR" and "AKS" respectively, this will take you to Kethsi. Upon arrival in Kethsi, move north into the ruins and search the rubble near the water. You will uncover a Tetrahedron 4. If you go east of this rubble, you will see a delightful mural on a wall of what appear to be huge dragons breathing fire and destroying cities. 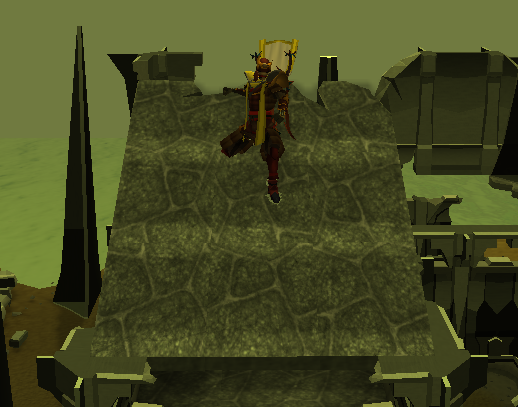 Now it is time to begin navigating around Kethsi, beginning by climbing the ramp in the main section of the ruins. After ascending the ramp, go north, where you will see an object labelled "Strange Wall Design". On this, you will see a small circular indent, perfectly fitting for say, a collar! 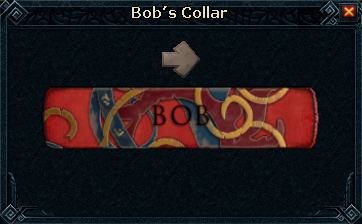 Use Bob's collar with the design and you will be presented with the following screen, as well as the information that "It looks like a collar might fit here somehow." The objective here is to maneuver the collar into the right position on the design. To do this, first you must flip the collar so it says "Bob", then you must rotate the collar anti-clockwise, and move it to the far right free strip. Reading the two notes, addressed both to Bob and yourself reveals that Robert the Strong did in fact know he was going to be reincarnated on a cat, and hid the details of the location to Kethsi in the collar that Bob the Cat is wearing. The note to you will say that you must speak to Bob and present him with the note, as well as the necklace (which was a necklace made by Robert's sweetheart) to convince him the note is worth remembering. He also informs you that you must not give it to him as a cat. Now run south, and jump across the ledge, landing next to the one armed statue. Now use the statue arm you just obtained from the wall on the statue; this will cause a spire to fall and create a bridge for you, opening the path to continue. Walk across the spire and climb down the ladder to continue. You will now find yourself across the first body of water blocking your path in Kethsi. east of the ladder is a broken wall, which you can click on to perform a wall jump, allowing you to move further along. After landing, climb the wall next to you and you'll find yourself on a raised platform with two long poles in front of you. Click these to swing to them. Now, walk across to the beam to the east and jump down the gap, leaving you next to another ladder. Rather than descending the ladder, walk south and leap to the next floor and go down that ladder instead, finding yourself across the second body of water. Squeeze through the pipe slightly north-east of the ladder, and remove the pickaxe from the rock next to you, if you haven't brought your own. Now mine the rubble blocking your path. Once you clear the rubble you can once again climb the far northern wall. 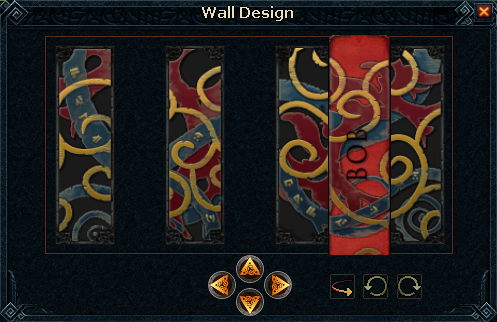 After doing this click the "run" option to run across the wall to the next part of the course, then run the second wall to a small platform. Then swing across the hand holds towards the western ladder. Go down to the ground floor, and run outside the main building, and go east until you find a large broken wall lying down. Search the rubble here and you will find a Tetrahedron 3 and a Strange Device. Now, return to the ladders and go up twice, to the top floor and jump across to the next platform. Go south and slide down the roof. Once down here, if you have forgotten your spade, there is a chance to pick one up here at the respawn. Go south and cross the plank across the water, search the rubble nearby to find the fourth Tetrahedron. Now walk back across the plank and descend the stairs near the drop from the roof. You will appear in a dimly lit room, with four indentations in the wall. Place a tetrahedron in these indentations and you will be given a dialogue box telling you a number, and the equivalent letters. This is random for each player. Insert all four tetrahedrons into the indents and take note of the corresponding numbers (eg. 1=E, 2=A, 3=E, 4=E). Now, return to the surface, and prepare for a little bit of a challenge. Climb up the wall next to the roof you slid down, climb the ladder, jump the wall and cross the hand holds again, backtracking a little. 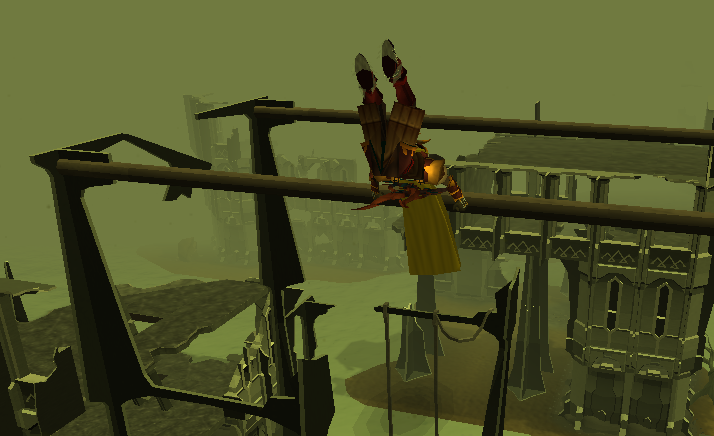 Then, jump off the platform to be in the northern part of Kethsi, on the ground floor. Now, check your strange device, it should tell you a series of four letters (eg. "EAEE"). As you move around, the letters on the Device change, your objective is to move to the spot where the device corresponds with the four letters in numerical order that were given to you when you inserted the tetrahedrons. Eg, if 1=E, 2=A, 3=E and 4=E you want to find the spot where inspecting your Strange Device tells you E A E E.
To do this, move around until the first letter from the tetrahedrons corresponds with your device. The first letter changes as you move east or west. The second letter changes as you move east or west. The third letter changes as you move north or south. The fourth letter changes as you move north or south. Once you find this spot, use your spade and you will unearth a key. After digging up this key, complete the course again and head back down the stairs, to the room in which you made use of the tetrahedrons. Now use your Kethsian Key with the previously locked door in the room to move through it. 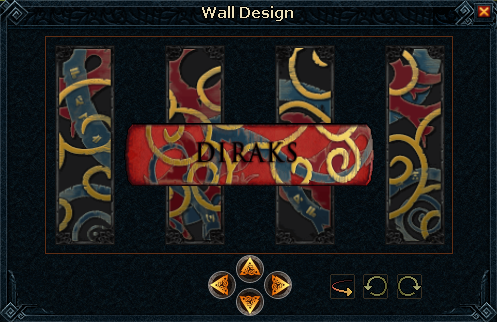 Once through the door, search the two clickable bookcases in the room to get the following two items, Dathana's Message and the Tune Bane Ore Scroll. Reading the spell will enable you to learn the "Tune Bane Ore Spell", a Lunar Magic spell which requires 87 Magic. Then read the message from Dathana, which tells you she thinks she is the last member of the Mage Conclave of Kethsi. She tells a story of her now-extinct race of people, who once discovered the Stone of Jas, and used it to make their civilization vast and wealthy. 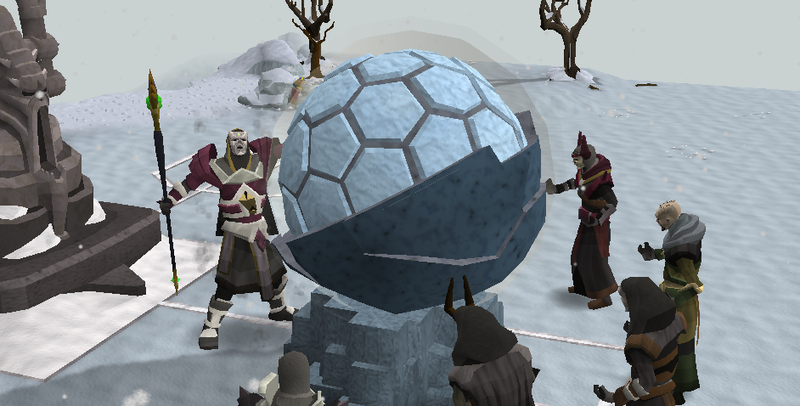 However, making use of the stone to do so enraged the Dragonkin into attacking, driving the people to extinction. She then goes on to tell of a last ditch effort which was successful in killing some of the Dragonkin, weapons made from an ore called bane, and tells you this may be the only way to defeat the Dragonkin. After reading this message and reading the spell you decide you have learned enough interesting information to once again return to Sir Tiffy in Falador Park. Return to Tiffy and talk to him again about Ritual of the Mahjarrat. You will tell him all you have learned about the Dragonkin and Kethsi, and he reads the journal. 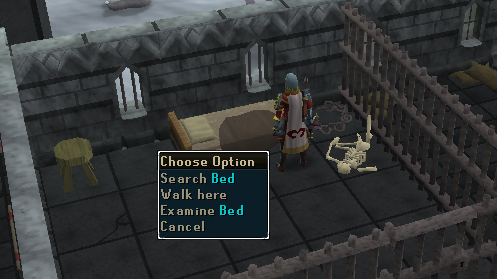 He then recommends you take this information to Akrisae, Thaerisk and Idria in Falador Castle. 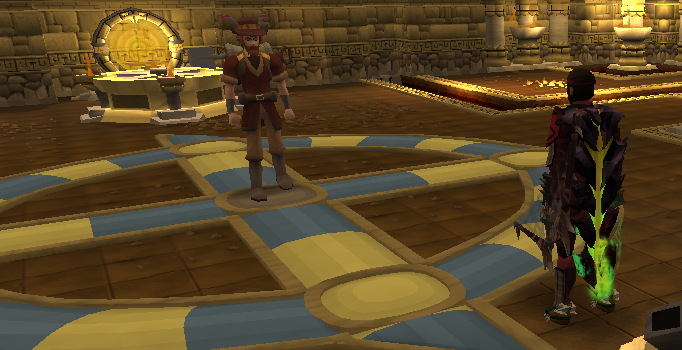 After completing the conversation, go to Falador Castle to speak to them. 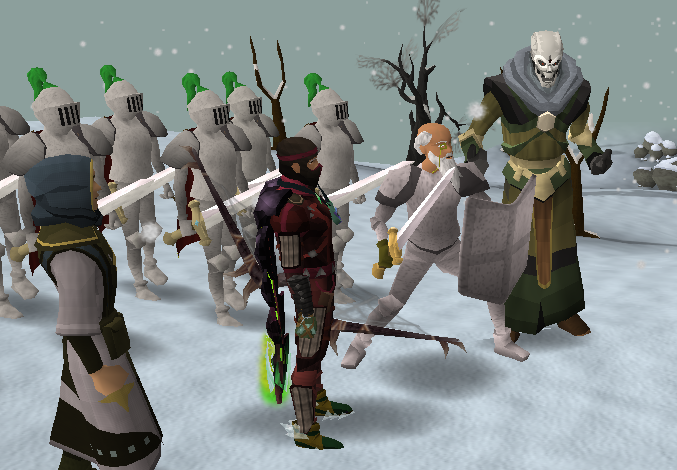 Once in Falador Castle, begin talking to any of the three NPCs, it doesn't matter which as you address them all as a group. After informing them of the impending doom, Ali the Wise appears and offers some pearls of wisdom. He has traveled from Nardah to warn you that the Ritual of the Mahjarrat should be beginning anytime now, if the stars are to be believed. He suggests that you team together with other Mahjarrat to defeat Lucien, despite his possession of the Staff of Armadyl and Stone of Jas. After some opposition to the idea, you vouch for some of the Mahjarrat you've met before, citing that they aren't all evil, which is enough for Idria and Thaerisk to agree to the plan. However, Akrisae will still require some convincing that any of the Mahjarrat are not purely evil and can be trusted. Select the third option, criticizing her for being willing to put everyone's lives in danger to save association with an evil being. Then tell her you cannot think of any other way, then satisfy her at the third dialogue by saying "Yes, we'll have to be careful." Then volunteer to risk your own life in order to negotiate such an alliance. You will then be instructed to do so, and the conversation will continue, discussing the possibilities for the plan such as taking freeing Arrav from the control of Zemouregal and locating the Stone of Jas which may be in the Temple of Ghorrock. Ali the Wise will then give you Arrav's Heart to take to the temple, and instructs you to find alternative ways of combating Zemouregal's control of Arrav, before sending you off to visit your old friend Azzanadra in the digsite. Make your way to the Temple at Senntisten and discuss The Ritual of the Mahjarrat with Azzanadra, who is already aware that Lucien possesses the staff of Armadyl, but has never even heard of the existence of the Stone of Jas. After discussing the properties of the Stone, Azzanadra thanks you for once again proving your loyalty by bringing him this information, and says he must now rethink his strategies for the Ritual. You then discuss the possibility of an alliance, to which Azzanadra agrees. With this being the case, he says he now must ask you to perform a task for him. He tells you that the power Lord Zaros can bestow upon him does not leave the walls of the temple. However, he has been storing the power in some beacons, which he wants you to position at each cardinal point of the ritual site, making sure the north and south beacons are opposite each other, and the east and west beacons are opposite each other. The higher up each beacon is placed, the further they will be able to project their power. He then hands you the four beacons. Note: From this point on Ring of Visibility must be worn. It is recommended also you bring an Antifire potion for this part of the quest, as well as inexpensive armour and a weapon. 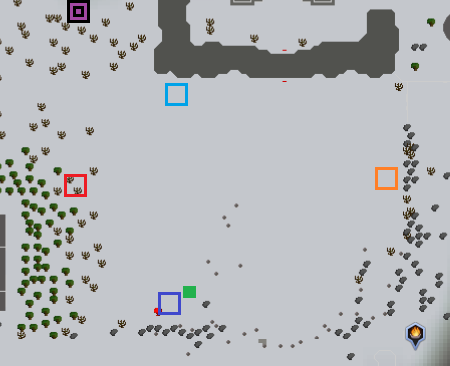 The red, dark blue, orange and light blue squares show the location of the west, south, east and north trees respectively, where you need to place Azzanadra's beacons. The overhanging tree is the black and purple square, and the the rock where you need to place Arrav's heart is the green square. 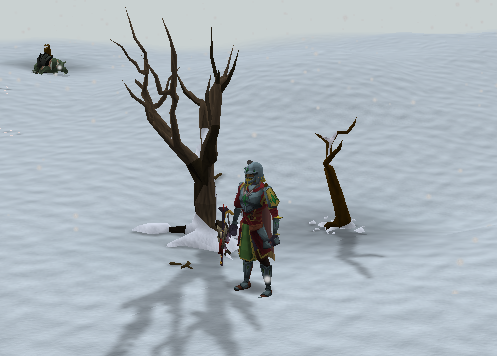 Now bank all the items you are unwilling to lose (quest items are retained automatically and can be kept on your person), and make your way to the icy temple west of the Frozen Waste Plateau. You must now return to the temple first visited during the Temple at Senntisten quest, with the Iron Dragons guarding it. Here you must protect yourself from the dragonfire breath of metal dragons, using either a protect from magic curse/prayer, an antifire potion, or a combination of the two. Go through the open archways into the temple. Once inside the fortress, climb up the stairs, then down the stairs. Scale the wall up, then go west and scale the wall down. You will find yourself at the familiar dungeon entrance which you must then enter. After entering, run to the south-western corner of the temple, and you will see a small Heat Globe lying on the floor, pick it up. Now, you must return to the surface, where the iron dragons lie guarding the fortress, run south and climb over the pillar. Then make your way through the tunnel and you'll find yourself in a barren land, complete with Undead Broavs. For this part, you must avoid contact with the Undead Broavs, or you will be thrown into a jail which you must escape from before continuing the quest. In this part you must place each of the four beacons around the ritual grounds. You hide them in trees with snow around the stump, upon examination they read, "Maybe you could hide something here." If you are caught too close to a Broav, it will alert a mage of your presence, who will teleport in, accuse you of snooping, and then whisk you away to a prison cell. If you search the bed, and have neither a spade nor a chisel with you, will find one of them in a secret compartment under the bed. 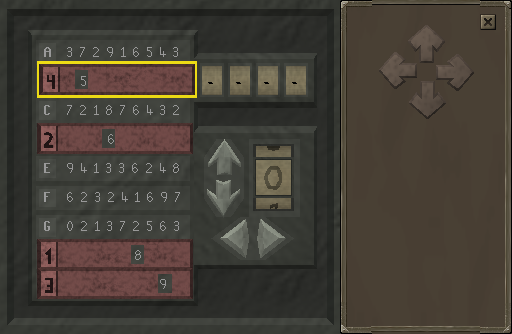 In the central, most eastern tile of the room, there is an option to dig up the tile and escape. Do this, and using your chisel and spade, freedom is yours! After you've done this, go northwest until you see a cave entrance with an overhanging tree above it. Use your rope here as it will be used to help you get back later without having to traverse the wilderness. 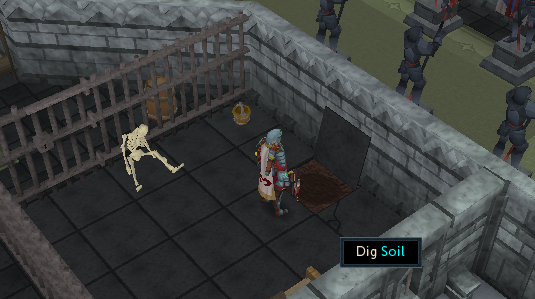 Next, you must infiltrate Zemouregal's base to free the hold he has over Arrav. The easiest way to get there is to run into a Broav, get arrested and escape again as you usually do. Go south to the main entrance door, then kill the Armoured Zombie nearby for a Code Key and Decoder Strips. Now, return to the main entrance door and read your code key. This is different for each player, and will present you with four letters (eg. "HDIB"), with the first letter (in this case H) being strip #1, second (in this case D) being strip #2 etc. Then move each strip over the letter it corresponds with, and this unlock the door. 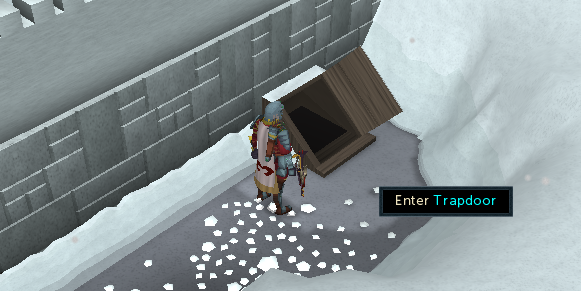 The door will then unlock and you can step inside the base. If you go up the western staircase you will see that you've actually found Zemouregal himself! He is currently discussing battle plans with a monster named Sharateerk behind closed doors. You overhear that Arrav is in place and ready to be summoned to battle at any time. If only he knew. Go back downstairs, and search a crate near the eastern staircase, and you will be given another code key. You must do the same with this key for the Storeroom door as you did with the main door to the fortress and unlock the door. After unlocking the storeroom door, step inside and go through the door to the north. Search more crates in here to be given some notes on Heart Magic, and another code key for the Reliquary. Using the Reliquary key code, unlock the Reliquary door, the same as you did for the last two doors, and step inside. In the southern end of this room there is a black stone on a pedestal which you must smash, this is the prism talked about in the Heart Magic Notes you found earlier, and in destroying this you have weakened the hold Zemouregal holds over Arrav! Now, return to barren, icy plains, just past the pillar guarded by iron dragons. Running south-east from the entrance you will see Movario! Chatting to him can bring some funny results. However, he informs you he is also looking for the Stone of Jas and that he feels it is close by, as Lucien's base is in close proximity too. Near Movario, if you are wearing your Ring of Visibility, you will see a Shadow Pedestal, place your heat globe upon it. After placing it upon the pedestal, the nearby ice will melt and reveal a cave entrance. If you try to enter the cave you will be given a warning the "Danger Lies Ahead" and to prepare. Teleport away and prepare yourself for a fight! The safest way to return to the scene without going through the wilderness is to use Fairy Ring code DKS into the Snowy Lands, run down the mountain and go north to a canoe which will take you to the entrance to the cave with the rope for you to climb up, helping you to get back without having to brave the risk of being PKed in the wilderness. Climb the rope and run south-east to find the entrance to the cave again. For this fight it is recommended that you use Ranged, and take a familiar full of high tier food. It is not recommended to use brews, as, due to touching the Stone of Jas your levels are boosted to levels of over 190, and using Saradomin Brews will lower them for the entirety of the fight. It is also possible to use melee tactics, but these are more food consuming, since using range only it is possible to safe-spot the monsters. It is also recommended to bring plenty of prayer-restore potions, as well as good ranging armour, eg Armadyl, Karil's, Void. After entering the cave you will be in an icy cavern, with an Energy Barrier to the east of you. Past the barrier you can see a wealth of bane ore! A powerful force prevents you crossing it at this time so you must carry on south, where you will find the Stone of Jas. 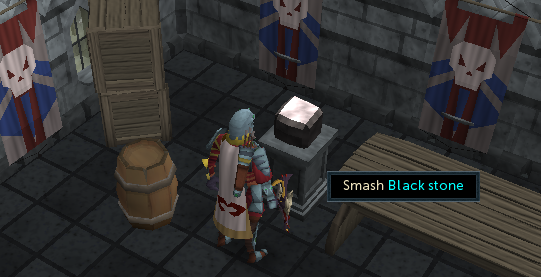 Once you touch the stone you will enter a cutscene and be "Overcome with a vision" - the vision is of Commander Zilyana fighting during the God Wars, however, she is ultimately defeated. 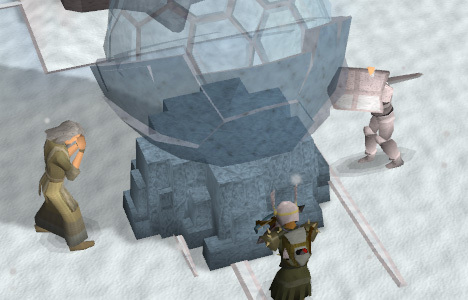 She is saved by Saradomin himself and escapes death by inches through Saradomin's use of the Stone of Jas, or, as he refers to it, the Eye of Saradomin. 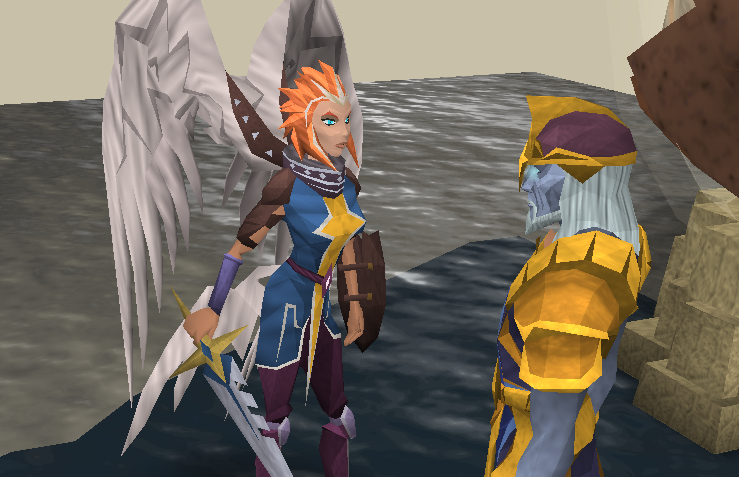 Zilyana vows to protect the stone from the hands of chaos forever, and the cutscene ends. At the end of the scene you will be teleported from the Stone to a waiting army, lead by a combat ready Sir Tiffy! You will learn that the ritual has begun, and that Mahjarrat forces have begun fighting all over the plains, and that many of your own allied forces have managed to join in the fray, thanks to the rope you left behind earlier. Sir Tiffy will then rally the troops to march forward into battle. And so it begins. Note: This fight section can be completed in stages, allowing you to teleport out and re-stock after each cutscene if necessary. Almost immediately after beginning the march you will be confronted by none other than the famous Lord Khazard himself who Level 105, commanding a small troop of Level 84 Elite Khazard Guards. At this point you learn that Ali the Wise is in fact a Mahjarrat! Wahisietel to be precise. You will then be given the option of whether or not you suspected Ali was Mahjarrat, and regardless of your choice you learn that Wahisietel is still on your side and here to help. Thank Goodness! Thanks to touching the Stone of Jas your powers have been greatly enhanced, and can make short work of General Khazard, and Sir Tiffy is not too shy when it comes to combat, we discover! Before long General Khazard will summon his pet dog, Bouncer to aid him. In this form only a Mahjarrat can kill him, so you must lure the dog towards Wahiestel who will kill the dog almost instantly. You may then continue the assault on Khazard. He can hit very high but protect from magic seems to almost completely negate his attacks. After bringing Khazard and his troops under control, he refuses to give in and teleports away, however, Wahisietel reveals he will not have gone far at such an important time and will be found again. The next part of the fight, you will meet Lucien, who then reveals himself to Wahisietel. 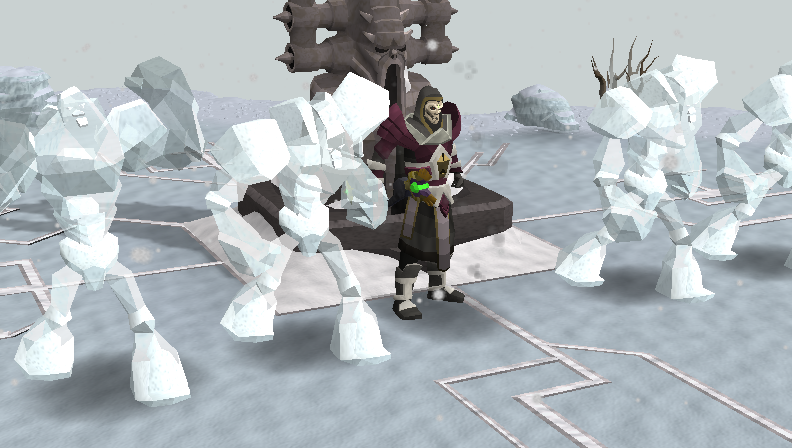 He demonstrates his power by summoning a small army of level 98 Ice Giants. You need only kill two of the giants, and they have an extremely high amount of Lifepoints. The best method to this is to lure them away from the main portion of the fight, always protecting from magic. Lucien also fires a spell at you that affects the immediate area surrounding where it lands, this can be avoided by simply moving a few squares away, and repeating when he fires the spell again. Eventually, you will kill the two Ice Giants, and your allies will dispatch of the rest. After this, another cutscene will ensue, and Sliske will arrive to aid the Zarosian cause (that's you! 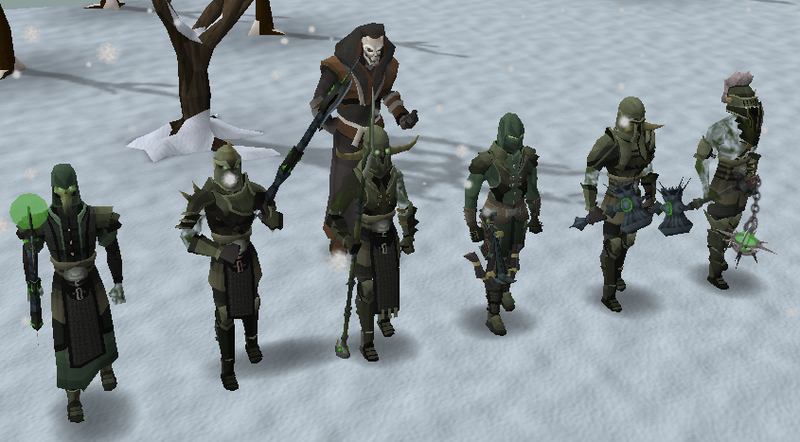 ), and will bring along the Barrows Brothers to help you out. Lucien will then summon a small force of level 98 Ice Demons, who can be killed in much the same way as the previous Demons. However, these demons can also fire a spike trap at you which can make it difficult to avoid Lucien's spell. These fights are time consuming, but, if done correctly, require a small amount of food. After killing this new wave of demons, the remainder of the Mahjarrat arrive and are thirsty for blood. Lucien declares himself to be in charge of the proceedings, given that he is the most powerful Mahjarrat. He declares that the sacrifice is not with them currently, but hiding below. He then uses a spell which raises Jhallan from the ground and awakens him instantly from his slumber, crippling him. However, Wahiesel declares that it is crucial that Lucien be sacrificed and the battle renews. Zemouregal brings along help to aid Lucien, his friend from the fortress, who in turn summons some Armoured Zombies. 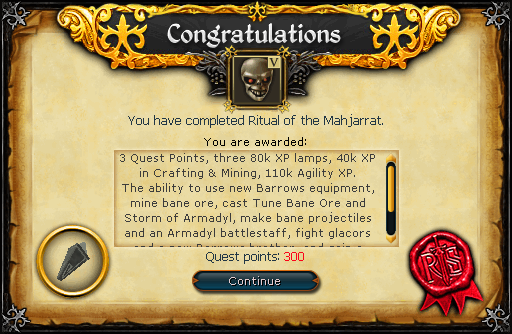 Kill these Zombies, with the aid of the Barrows Brothers and Arrav will be summoned. Attack Arrav until he turns his attention to you. Once he is following you, lure him towards the rock in which you hid his heart and he will break free of Zemouregal's spell, turning on him and beginning to avenge his centuries of slavery. 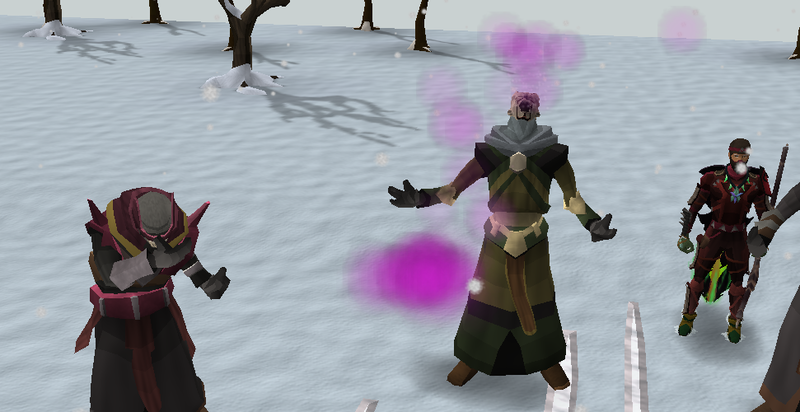 Azzandara wishes to use the full power of Zaros, but one of the beacons you placed has broken. Protect from magic and run toward the beacon parts, ignoring the battle raging around you. 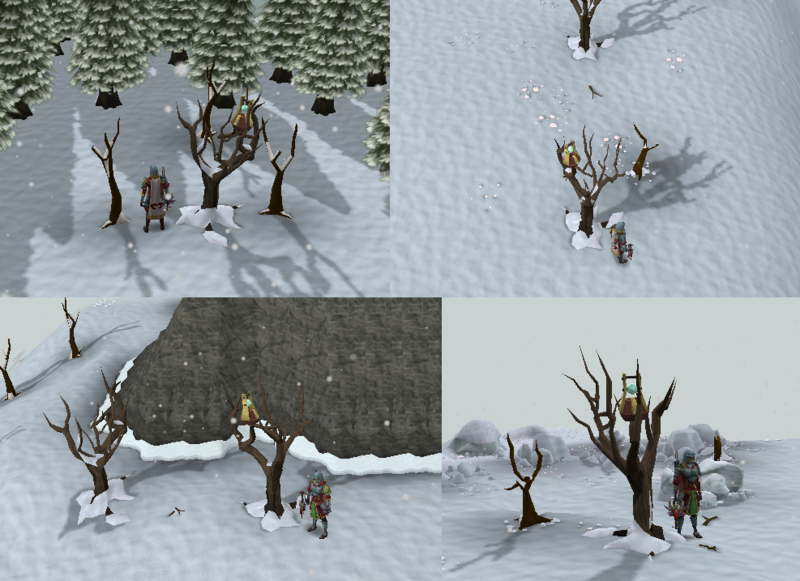 Pick up the four pieces of the beacon, put them back together and put it back on the tree. After you fix the beacon and replace it in the tree, Lucien declares that there has been enough fighting and he will decide who shall die. This leads to another cutscene in which Lucien declares that Jhallan shall be sacrificed and kills him. As a result of the sacrifice, all the Mahjarrat are rejuvenated and regain full power, and their true forms. After the sacrifice of Jhallan, Azzanadra declares that it is now Lucien's turn to meet his demise, and unleashes the full power of Zaros upon Lucien, hitting a 9001, followed by a 18890, but this is not enough to vanquish Lucien. In retaliation, Lucien declares that Azzanadra forced his hand, as he did not wish to spill any more Mahjarrat blood, and summons the Stone of Jas to him, to enable to him to kill Azzanadra. Lucien grabs hold of the stone to enhance his powers and end the fight for good. However, this re-alerts the Dragonkin who arrive on the scene almost instantly. 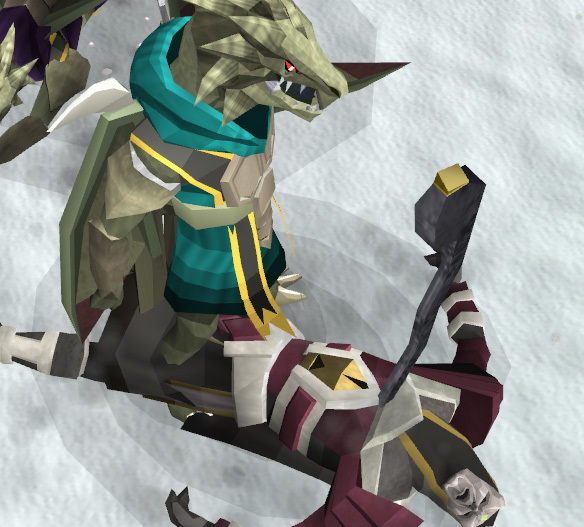 After questioning Lucien's power a small scuffle breaks out, during which Lucien bodyslams the Dragonkin before eventually being overpowered and pierced by the Staff of Armadyl. Lucien is dead, at last! Seeing the strength of the Dragonkin forces the Mahjarrat to flee the scene, lest they suffer the same grizzly fate. 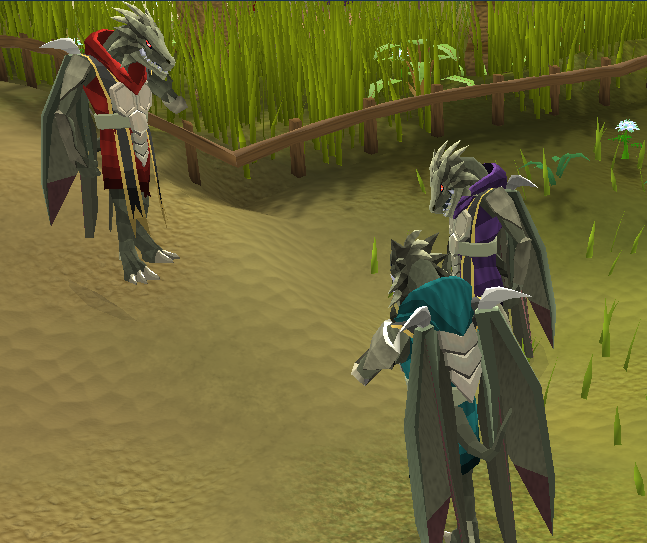 The Dragonkin warn that they will destroy Gielinor to sate their rage and leave. 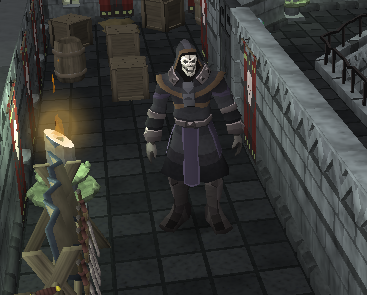 Only Sliske and Ali the Wise remain, and Sliske decides you'll make an excellent addition to his collection (by forcing you to join the Barrows Brothers), and fires a spell at you to turn you into one of them. Fortunately Akrisae intervenes and takes the spell for you, becoming a servant of Sliske who then retreats into the shadows. It is then decided that the Stone of Jas must once again be hidden, and Sir Tiffy calls upon Thaerisk to aid with the problem. He suggests a teleport spell that will be drawn from 3 numbers from within each of your heads, so that nobody would know the exact location of the stone. 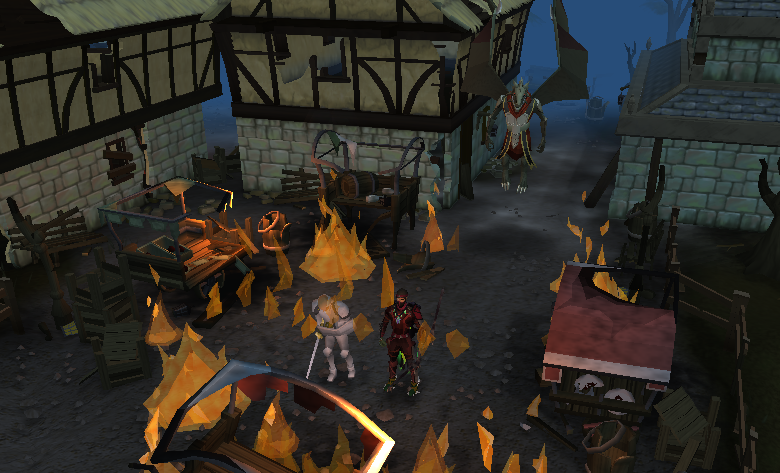 After the spell is completed you teleport back to Falador but are drawn into an eerie vision of Draynor, in ruin. 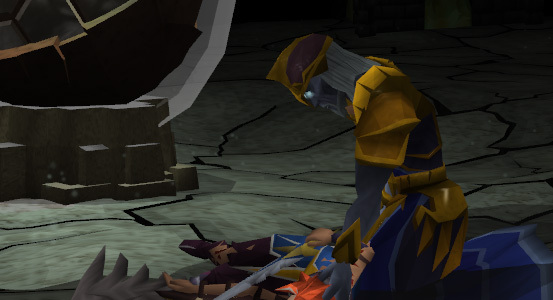 For the first time since While Guthix Sleeps you see the fallen heroes, Duradel, Hazelmere etc. 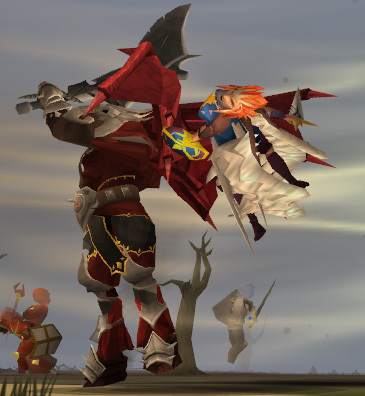 Eventually the Dragonkin find you and blast Sir Tiffy to cinders, before warning you of the same fate, telling you their destruction will begin in Edgeville. The vision then ends and you find yourself in Falador park alongside Sir Tiffy who did not experience the same warnings as you did. Speak to him and he will congratulate you on having assisted in eliminating such a powerful evil from the world. 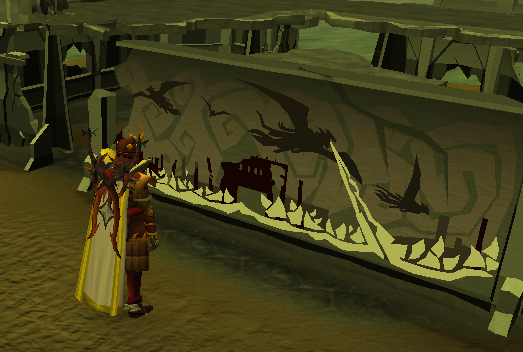 After the quest, if you now teleport to Edgeville, it has indeed been reduced to rubble as foretold by the Dragonkin. 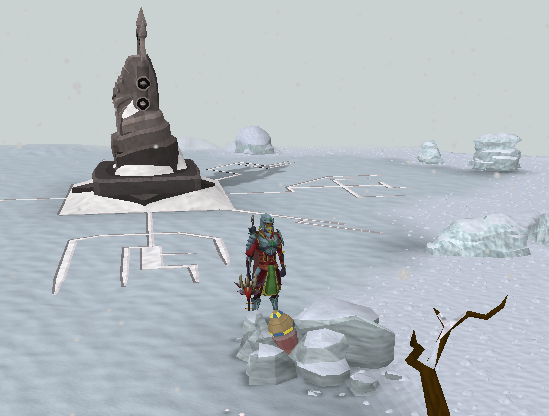 After concluding the quest you can speak to Arrav who is located in the northern portion of the ritual site. As he is no longer kept strong by Zemouregal's curse, Arrav is feeble and on the verge of his passing. 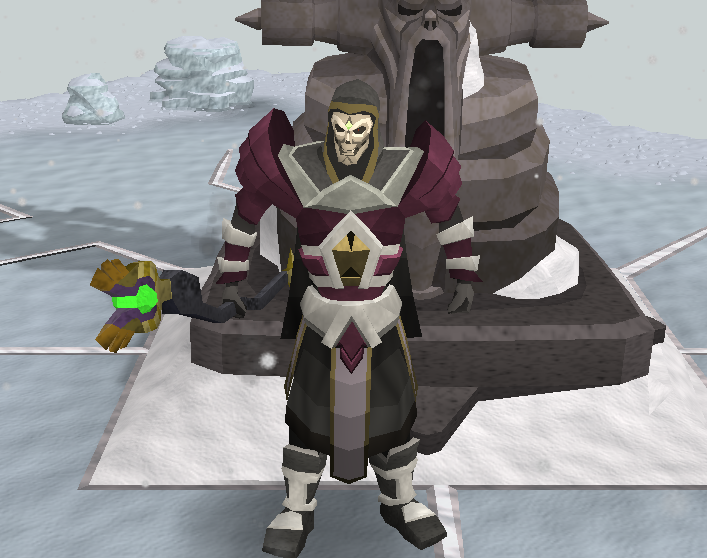 Speak with him to have one final discussion with the Runescape hero. Eventually he will collapse and be put to rest. 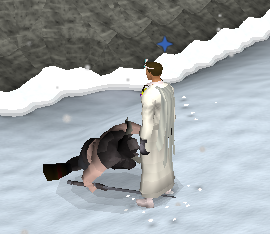 You will gain 3,000 prayer experience for doing this.